I can tell you, these pickles are as vibrant in taste as they are in color. 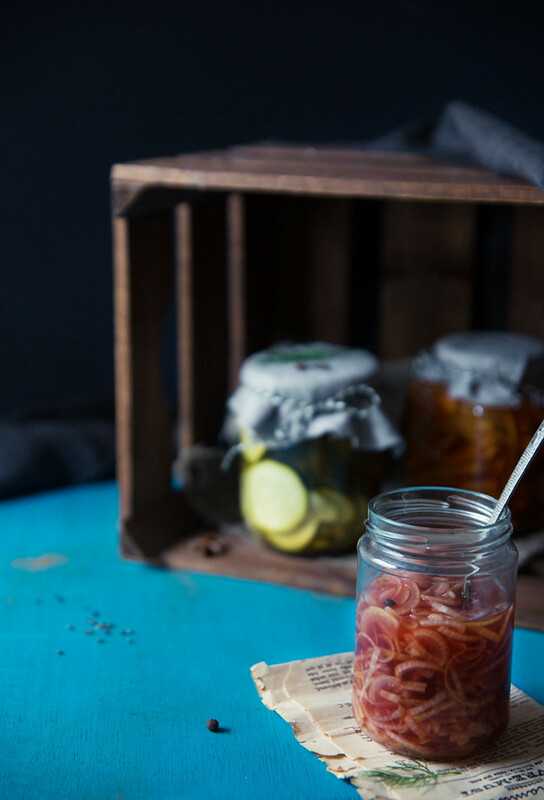 The basic ingredients and method comes from a Quick Pickled Onion recipe by Sprouted Kitchen, which I found via My New Roots. I’ve slightly altered the ratio vinegar-salt-sweetener and adjusted the spices somewhat. You can find the original recipe here. I love how there’s endless possibilities for varying the flavors with pickles. Feel free to go crazy and throw in anything you can find in your pantry! Bay leaves and peppercorns are a good starting point. They create these deep, umami flavors and works with most veggies, roots and onions. For a Christmast-y touch I added cloves and star anise to the carrots, and for the zucchini I went for an (almost) classical cornichon flavoring of dill, mustard seeds and scallion. You can of course use cucumbers for pickling purposes (”Västeråsgurka”) or gherkin instead of zucchini, although I couldn’t find any at my local supermarket. Later we enjoyed a fully vegan, gluten-free and mostly raw dinner that turned out incredibly well if I may say so. An entire potpurri of different little dishes and dipping sauces. Almost like a vegan Christmas dinner! Or Thanksgiving dinner for that matter, although the correlating dates was entirely coincidental. The leftovers today are *outstanding gesture emoji*! 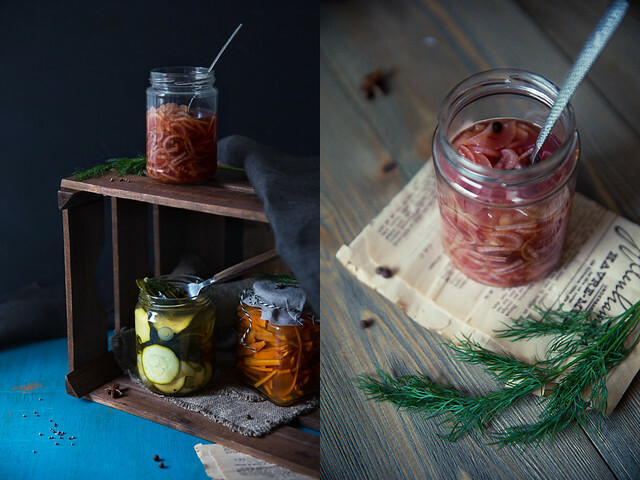 If you finish your pickles very quickly (which I’m sure you will), you can use the leftover brine for salad dressings or another batch of pickles. Stored in fridge in disinfected glass jars they will last for around two weeks. See directions below for sterilizing jars. Clean 4 medium sized glass jars with soapy water, rinse and put in a large sauce pan. Cover with water and bring to boiling. Let boil (but not too heavy or they may crack) for a couple of minutes before transferring jars to a clean towel. Only use clean utensils and avoid touching the inside of the jars with your hands in order for the pickles to last longer. Peel and thinly slice beetroot. Peel and cut carrots into match sticks. Rinse and thinly slice zucchini and scallion (white parts omitted). Coarsely chop dill sprigs. Peel, halve and thinly slice onion. In a medium sauce pan, carefully heat vinegar, salt, agave syrup (or honey) and spices until salt has dissolved. Add your sliced vegetable (in the case of zucchini, also add scallion, dill and lightly toasted mustard seeds), and stir until slices have separated and are completely covered in brine. Transfer to a glass jar and put the lid on. 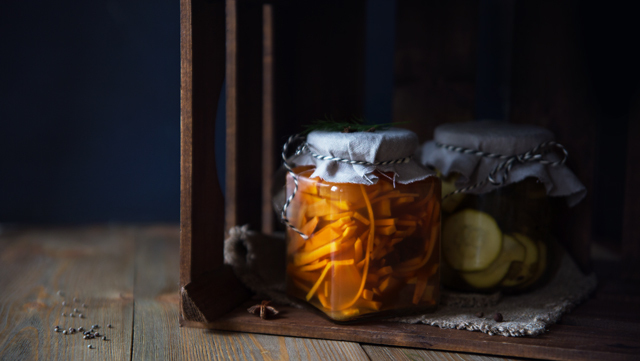 Easiest is to use a fork or perforated ladle and first fill up the jar with the vegetables and then pour over the brine until veggies are completely covered. To speed up the cooling process the jar can be stored in the fridge. Last for about two weeks in the fridge. 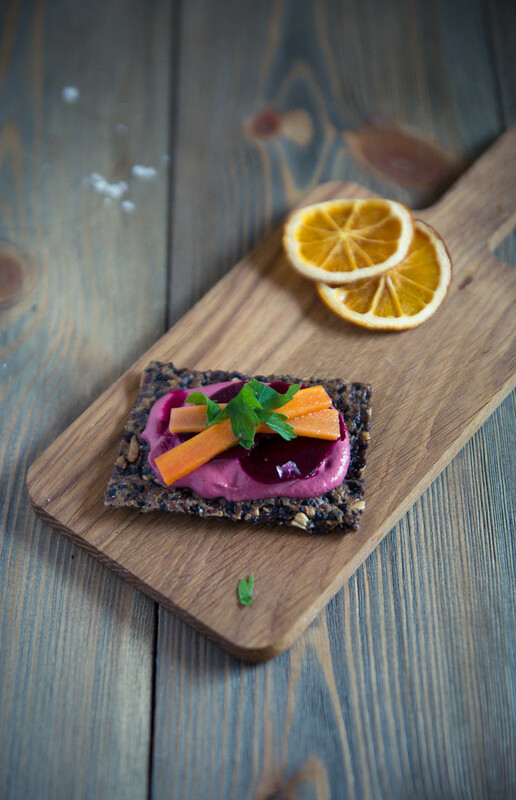 Serve on seed crackers with tahini or beetroot pesto, with your lunch sandwich, in salads or with basically anything else! All photographs, recipes and content are Cashew Kitchen originals, unless otherwise indicated. Please link back to me when sharing.